latchesinferred | a verilog blog – a veriblog! 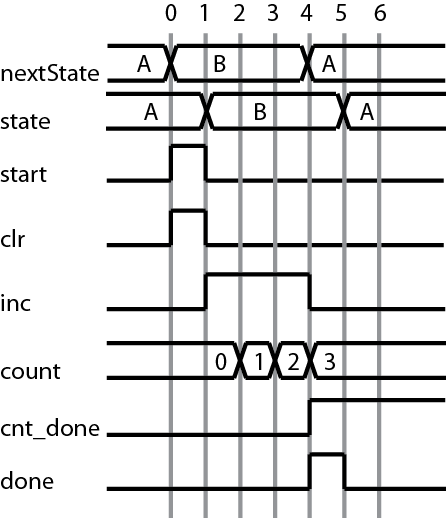 a verilog blog – a veriblog! One of the most difficult aspects of coding in hardware description languages is ensuring that all of your timings are correct. The purpose of this post is to provide some fundamentals in understanding how signal timing is simulated and how to think about it properly. If you understand this post, you should be able to make accurate predictions about when signals will get asserted in your designs. Imagine some asynchronous signal A is asserted between two clock edges as shown below. Also imagine that A is an input to a positive edge triggered D flip-flop. The output of the flip-flop, B, will take on the same value as A shortly after the first rising clock edge following the assertion of A. Due to the propagation delay of a flip-flop, it will take some brief time before the output of the flip-flop begins showing the input. This can be seen in figure 1(a). Often times when simulating our designs, however, we will not model delays. This results in a waveform much like that seen in 1(b). A finite state machine includes some state S that outputs a signal “count_inc”. This signal is a control signal to a counter, which causes the counter to increment by one. If the machine enters the state S on clock edge n, at what time would you expect the counter to increment? The correct answer is show in figure 2: the counter will not increment until clock edge n+1. This may seem odd at first given that the count_inc signal appears to be going high on clock edge n. In fact, the reason for this behavior can be understood quite simply. Recall that the outputs of a finite state machine come from a block of combinational logic that takes the current state as input (and, in the case of Mealy Machines, the external inputs). If the state register changes on (or soon after) clock edge n, then the combinational signal count_inc cannot change until after this point in time. Thus, count_inc cannot possibly be asserted in time for the nth clock edge as seen by the counter. A general rule that can be followed when observing waveforms is that whenever any combinational signal has an edge on clock edge n, the corresponding sequential outputs will not change until clock edge n+1. Let’s see an example of this with a simple FSM, one that merely counts up to a certain number when asked and returns a “done” signal upon completion. Notice that while the start signal goes high on clock edge 0, the state does not actually change until clock edge 1. Likewise, while the “inc” signal goes high at clock edge 1, the counter does not actually increment until clock edge 2. Once you understand these fundamentals, it should be clear to you prior to simulation what every signal in your design will be during simulation. If you enjoyed this post and want to learn more about timing, I plan to create a post specifically about FSM timing. Stay tuned! This post is about a paper entitled “Synthesizable Finite State Machine Design Techniques using the new SystemVerilog 3.0 Enhancements” written by Clifford E. Cummings. Though this paper is a bit dated (published in 2003), it contains a lot of interesting and helpful information about FSM design. I highly recommend reading the paper in full (not including the title page, References section, and the code listings at the end, it is just over 33 pages). If you don’t have time for that, however, I provide a brief summary of the paper and list some of the more interesting things I learned from it. The paper begins by discussing several coding styles for FSMs written in Verilog-1995. Several coding goals are identified, such as being compact and easy to debug, which leads to several coding guidelines. In section 2, the author reviews six standard Verilog FSM coding styles of which four are recommended and two are discouraged. Schematics and corresponding code are given for a simple FSM example. In sections 3, 4, and 5 the author considers three additional more complex FSMs, showing their state transition diagrams. He contrasts the number of lines of code required to implement each of these FSMs in a recommend coding style and a discouraged coding style. Section 6 presents a graph plotting lines of code for each of the four FSMs for each of the six coding styles. Section 7 presents timing and area synthesis benchmarks for each of the four FSMs. Section 8 shows the timing and area improvements provided by the use of a few Design Compiler optimization flags. Sections 9 and 10 discuss improvements introduced by Verilog-2001 and SystemVerilog respectively. This style requires comparing lengthy bit patterns as opposed to simply each individual bit against 1. Consequently, it requires more gates, which means more time and area. I learned that using two always blocks (one combinational block for the output and next state logic and one sequential block for the state register) tends to be at least as good if not better than one always block (which implicitly contains the next state and output logic within the single sequential block for the next state) and the three always block (which separates the output logic and next state logic into their own combinational blocks) coding styles with regard to area and timing analysis. Fortunately this is already my preferred coding style for FSMs but it is good to know! Not only does SystemVerilog include . * implicit port connection capability, it also supports .name convention. This convention is the same as .name(name) but saves typing when the name of the port within the instantiated module matches the name within the module in which it is instantiated. will assign all 1’s to foo regardless of its bitwidth. Likewise for ‘x, ‘z and ‘0. Always provide default next state and output logic assignments above your case statements. Using x’s when possible to improve optimization and assist in debugging (an unexpected transition to state ‘x is a red flag). Use parameters rather than `define macros when possible. Code all sequential always blocks using non-blocking assignments. Code all combinational always blocks using blocking assignments. Cliff Cummings, President of Sunburst Design, Inc., is an independent EDA consultant and trainer with 21 years of ASIC, FPGA and system design experience and 11 years of Verilog, synthesis and methodology training experience. Mr. Cummings, a member of the IEEE 1364 Verilog Standards Group (VSG) since 1994, is the only Verilog and SystemVerilog trainer to co-develop and co-author the IEEE 1364-1995 Verilog Standard, IEEE 1364-2001 Verilog Standard, IEEE 1364.1-2002 Verilog RTL Synthesis Standard and the Accellera SystemVerilog 3.0 Standard. Mr. Cummings holds a BSEE from Brigham Young University and an MSEE from Oregon State University. This blog is named after a frustrating warning message which is sometimes encountered during synthesis of Verilog code. This blog post explains what that warning means, why you may encounter it, and how to remedy the situation. When the gate is a logic 1, the input propagates to the output. When the clock is low, it remains the same, by default. The simulator makes no changes to the variable if the gate is low and thus this is the behavior of the code when synthesized into an actual design. If you get a “latches inferred” warning, chances are, you probably don’t want it. Latch-based designs have certain advantages (they are smaller than flip-flops and can be used to create a faster design using a principle called time-borrowing), but are comparatively rare. All combinational outputs must be assigned for every possible input pattern. Assign all combinational outputs for every possible control-flow path through an always block. What this means is that whatever conditions exist which cause you to execute certain lines of code in your always block, all outputs must be specified in order to qualify as combinational logic. The latch code above violates this principle because if gate is a logic 0, q is left unspecified. As a result, the simulator leaves it equal to its current (i.e. past) value – which implies memory or state, not combinational logic. This is a fresh start at a blog about Verilog! The goal of this blog is to provide insightful tips and tricks to those grappling with digital design in both Verilog and SystemVerilog. I also plan to make posts about interesting projects I am working on or discoveries I make. My projects for these classes include the Mastermind game for the Spartan 3 FPGA, a gate-level implementation of a 32-bit IEEE floating-point unit, a partial USB 2.0 device controller, and a MIPS architecture. For Build18, a student-run ECE-project organization at CMU, I plan to help design a game of tetris which will run on the Xilinx Virtex-V FPGA and will use a PS/2 keyboard and supply VGA output.